His short question got a long answer, opening up this question in ways that I hope are not judgmental or dogmatic. Natural skincare becomes an extension of a healthy lifestyle, of being able to make informed choices, and without feeling guilty over our corporate crushes. Your skin is the largest organ of your body. It does more than contain your insides, your skin is a vast and dynamic filter. (A quick science aside – through ionic exchange particles penetrate the skin, dermal patches for medicine are a prime example of this process.) When we recognize the importance of our skin in our over all well-being it makes sense to really look at what we are applying to our face and body. Just as we seek a healthy diet of fresh food produced in safe and sustainable ways, we can nurture and nourish the health of the skin with natural and organic formulas that deliver real results. I believe in using efficient products that respect your body and our planet. Eat Food – Utilizing whole ingredients in skincare formulas gives us the synergies and ratios best absorbed by the skin. Organic carrier oils and essential oils form the basis of a healthy skin care, providing the necessary fats, anti-oxidants and omega acids needed to support cell function and protect the cellular membranes. Not too much – A little goes a long way. More doesn’t necessarily equal better. Know what the ingredients in your products are, and what they do. Not too much applies to the number of products you need too. A basic regimen of cleanse, treat and protect can be supplemented with professional facials, seasonally specific treatments (“cures”) and at home mini-facials. Mostly plants* – Avoiding petro-chemical and animal based ingredients are two things you can do to benefit the microcosm of your body that will have a profound impact on the macrocosm of the planet. Why natural skincare? Good for beautiful you, and good for our mother Earth. Learn more about Sheryl and her offerings at her website www.sherylleaf.com. 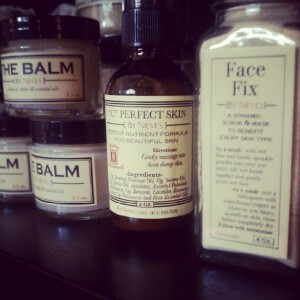 Her next blog post will discuss more in-depth the products she uses for her skin care treatments. *Full disclosure: I do sometimes use yogurt, ghee, honey and egg. I am passionate about sourcing locally and organically from ethical producers.